Athlete, George Puil is known as a prize football and rugby player and was a coveted newcomer when he arrived at UBC in 1949. Despite his slight 140-pound frame, Puil led the football team in scoring, responsible for exactly half of the team’s touchdowns. He then moved to the rugby team for the remainder of the season, where as part of a McKechnie Cup-winning squad, he quickly established himself as a top player. Puil helped to claim two more McKechnie Cup championships. In his final season as a Thunderbird in 1952, the team beat California-Berkeley in a four-game series to bring home the World Cup. The same year, Puil was named to the Evergreen Conference All-Star Football team. He graduated with a Bachelor of Arts and earned his Bachelor of Education in 1957. Puil retired following another decade representing British Columbia and Canada internationally. He didn’t leave the field entirely, though: he coached while educating in the Vancouver School District. 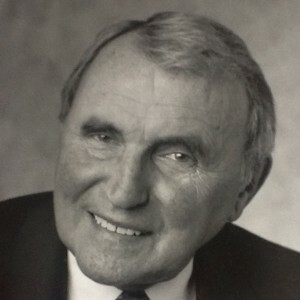 He later entered municipal politics and spent twelve years as a commissioner for the Vancouver Park Board; his time as a commissioner was followed by 26 years as a Vancouver City councillor. In 1994, Puil was inducted into the UBC Sports Hall of Fame, and received the UBC Alumni Achievement Award in 2000.